PRETORIA, SOUTH AFRICA -- Olympic runner Oscar Pistorius has been charged with murder in the death of his girlfriend at his South Africa home early Feb. 14. Reeva Steenkamp, 29, and Pistorius, 26, were the only two people in the upscale Pretoria home at the time of the shooting, police spokeswoman Denise Beukes said. In keeping with South African law, Pistorius will be named officially as the suspect when he appears in court. The first court appearance is scheduled for Feb. 15. Pistorius spokeswoman Kate Silvers said the athlete is "assisting the police with their investigation but there will be no further comment until matters become clearer later today." 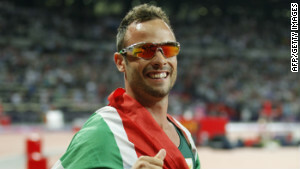 Police said Pistorius is cooperating with them. There did not appear to be signs of forced entry at the home, Beukes said. She also said there had been "previous incidents" at the home -- "allegations of a domestic nature." Steenkamp was a model. Capacity Relations, the agency that represented her, said she was the victim. Several South African media outlets reported that the woman was mistaken for an intruder. Beukes said she was aware of those reports, but they did not come from the police force. Pistorius' father, Henke, told the South African Broadcasting Corp. his son was "sad at the moment." "I don't know nothing. It will be extremely obnoxious and rude to speculate," the father said. "I don't know the facts." Beukes said that police were alerted to the shooting by neighbors and that residents "heard things earlier." A pistol was recovered at the scene, police said. South Africa has a high crime rate, and it's not unusual for homeowners to keep weapons to protect themselves from intruders. However, Beukes said, "This is a very quiet area and this is a secure estate." 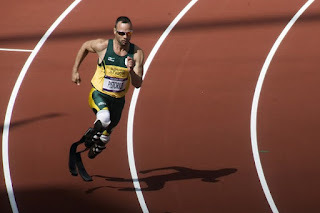 Pistorius, a double amputee, ran with the aid of prosthetic limbs during the London Olympics last year. His legs were amputated below the knee when he was a toddler because of a bone defect. He runs on special carbon fiber blades that led to his nickname. While he failed to win a medal in the Olympics, his presence on the track was lauded as an example of victory over adversity and a lesson in dedication toward a goal. 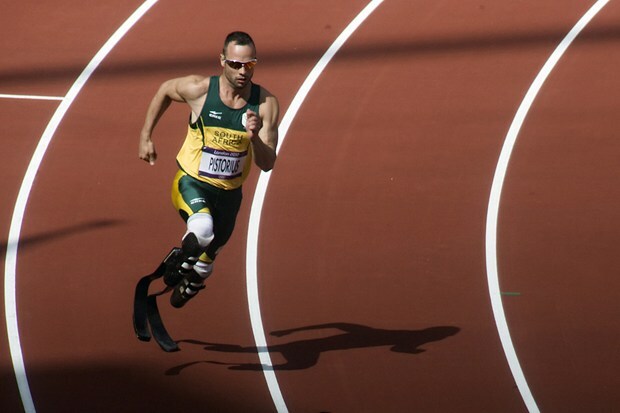 Pistorius was initially refused permission to compete against able-bodied runners, but he hired a legal team to prove that his artificial limbs didn't give him an unfair advantage. He smashed a Paralympic record to win the men's 400m T44 in the final athletics event of the 2012 Games. The athlete was among the men featured in People magazine's Sexiest Man Alive issue last year.